So, whilst browsing around the shops last week, as I do most lunchtimes much to the dismay and annoyance of my long suffering husband (as it’s really somewhat rare that I can walk away from shops with nothing to show for my efforts!) – I thought I’d buy myself a magazine for a spot light relief, to break up my workday and to catch up with the who’s who and what’s what with the world. And naturally I was immediately drawn to InStyle which had a particularly fab looking St Tropez freebie peeking out from inside the plastic cover! 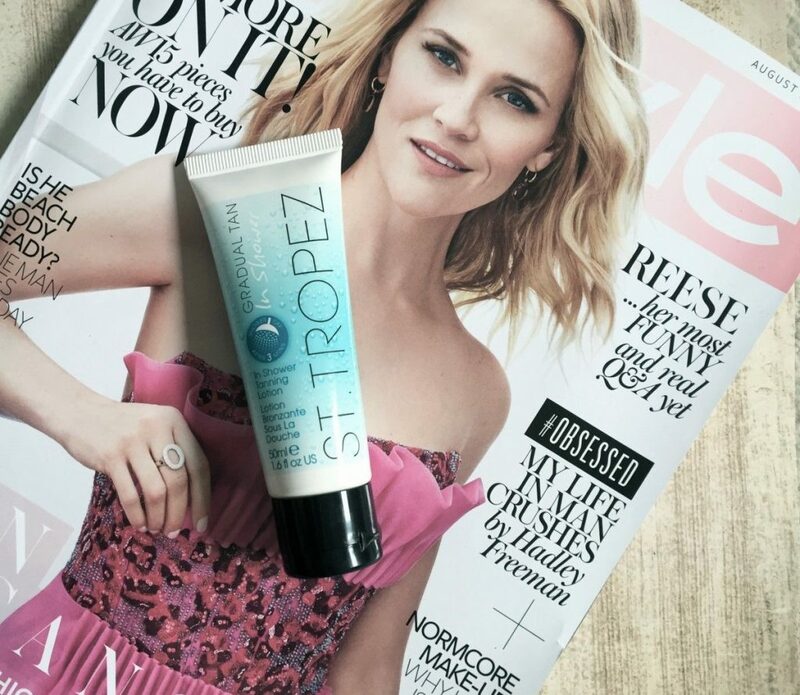 Personally, I’ve long regarded St.Tropez as rather a ‘go-to’ brand when it comes to self-tanning solutions. And it’s the one that sticks out in my memory as being the ‘celeb’s brand of choice’. But for me, I’ve also viewed it as one of the more expensive brands and for some bizarre and very unfounded reason, I’ve always assumed that I’d come out much darker than I would need or like, or that if I did opt for St.Tropez I should have it applied by a professional! Though as I say, totally groundless and silly! So, clearly intrigued, and enticed by the pretty amazing USP that it was a gradual tan that you apply and wash off in the shower, it struck me as a bit of a winner so I just had to try it! I mean – seriously, what could be more perfect for a busy mum! I geared myself up and had decided to just do my legs as I was still a little nervous. Once in the shower, I read, re-read and checked again at the instructions on the reverse of the tube, just to be sure I would be applying it correctly. Then, having washed and rinsed off the suds, as per the directions, I promptly turned off the shower and generously applied the St Tropez lotion all over my legs in the suggested circular motions. But, then because I had unintentionally applied it all over other areas of my body, whilst rubbing it onto my legs, I decided to throw caution to the wind and in a fit of bravery, applied even more of the cream generously over the remainder of my body – face included! Then, after standing like a bit of a lemon in the shower,(singing and twiddling my thumbs for what I was guessing was three minutes, I went to put the shower back on. And then went into panic mode! I twisted and turned the shower knob back and forth – trying my hardest to almost force some water out of the shower head above me, but no, nothing was coming out bar a piping hot trickle! So obviously I went into meltdown mode! There I was, ‘starkers’ in the shower, completely covered in a self-tan cream which in the past I have been rather nervous of trying! With now what it looked like as no way of showering it off! So after a good few more minutes of pulling out all my top plumbing moves and screaming irritably down at Mikey, as for some reason I thought it was his fault for not helping me fix the problem, I decided enough was enough. Thing is, once I’d showered off the cream – which was actually very easy, so I can imagine only easier with a full running water flow – I still had to shower off the conditioner on my hair. So down I nipped to the kitchen sink which had a little bit more of a trickle of water – though this time it was cold. So, having finally managed to shower, apply and rinse off the tan cream, I suppose this took me around 15 minutes all in. Luckily I saw the funny side of the situation and came to the understanding that what will be will be! And for some reason I was actually quite excited at the prospect of being even more bronzed than I’d originally planned. 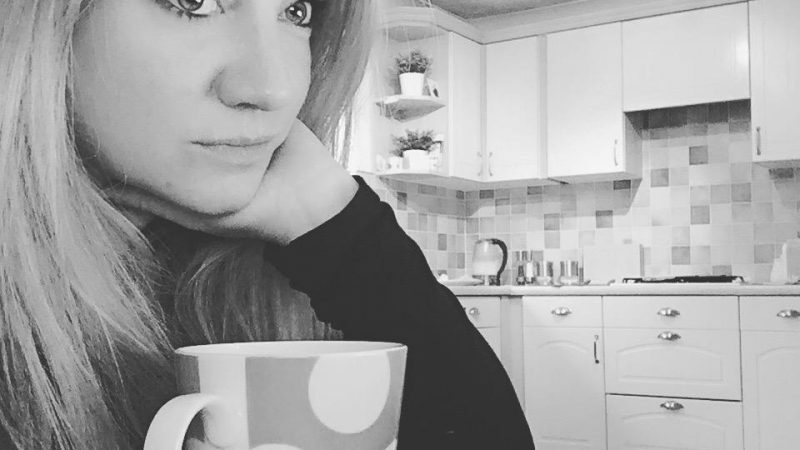 I must say though – it was certainly fabulous to have applied a fake tan, but to be able to go to bed with absolutely no sticky residue what so ever! I loved this! As soon as I woke up the next morning I nipped straight to the bathroom to check for the results. Perhaps my knees were ever so slightly browner, and possibly my décolletage and forearms too, but this may have been because I’d recently used another brand of self-tan, and was just topping up where there was already a bit of a base colour to begin with. So to be honest I was more than a little disappointed after such a faff the night before. Ok – so the faff was entirely due to our silly shower and the lack of water, but I’d certainly have thought that since I’d left the cream on for a lot longer than recommended, that I’d most definitely have at least some colour. Talk about an anti-climax – especially after calling all around my friends to tell them of the possible disaster and to warn them I might look a little different the next day! So, water and shower kerfuffle to one side (after all, it was nothing to do with the cream)…. 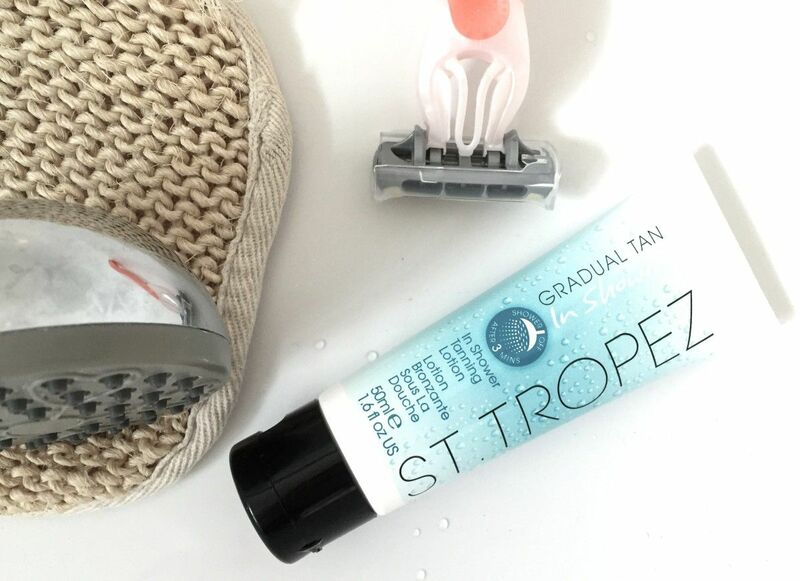 What are my thoughts on the St Tropez In Shower Gradual Tan itself? Well, if it wasn’t for the end results of this particular St Tropez product, I would actually be pretty impressed. Applying the cream in the shower to wet skin is surprisingly easy, although a little strange because it’s new and not ‘been done’ before. The directions say to apply generously – and I would say that what I thought was a ‘generous’ dollop went a very long way indeed, which is most probably why I decided to apply to the rest of my body. The only tricky part I found was that of washing the palms of my hands. In the shower I found I had to sort of angle my body and lean in to towards the shower, so as not to let the water splash onto the rest of my skin, which may have affected the overage coverage and ultimately the result. But, once out of the shower and all towel dried, I was ready to dress immediately. This I found excellent. I didn’t feel sticky at all, I just felt clean. And like I mentioned previously – this is perfect if you apply prior to bedtime – as they’ll be absolutely no stained sheets in the mornings! So, on to the results. I’m afraid this is where I felt a little let down with the product. I had essentially no tan to show off and really did wonder why I’d even bothered. Which I actually feel is a terrible shame due to the huge potential of the new and innovative product. Perhaps this specific self-tan product wasn’t aimed at me though, and instead is aimed at those who have really, really pale skin. Where maybe then, you would see a subtle bronzed glow, though to be honest – I’m not exactly dark skinned myself, not even olive skinned. Obviously it is marketed as a ‘gradual tan’ so should be applied over a course of some days so as to darken the colour, but this would obviously be far more expensive as I would need to go out and buy more tubes at £14.50 for 200ml, and I’m afraid to say I don’t really see it as worth it at the moment where I can get far quicker results from far cheaper products. But, it has got me hooked in some way – because I feel the need now to want to try another of their products – purely to measure against my current brand choices. I am intrigued now at the colour which could be achieved. 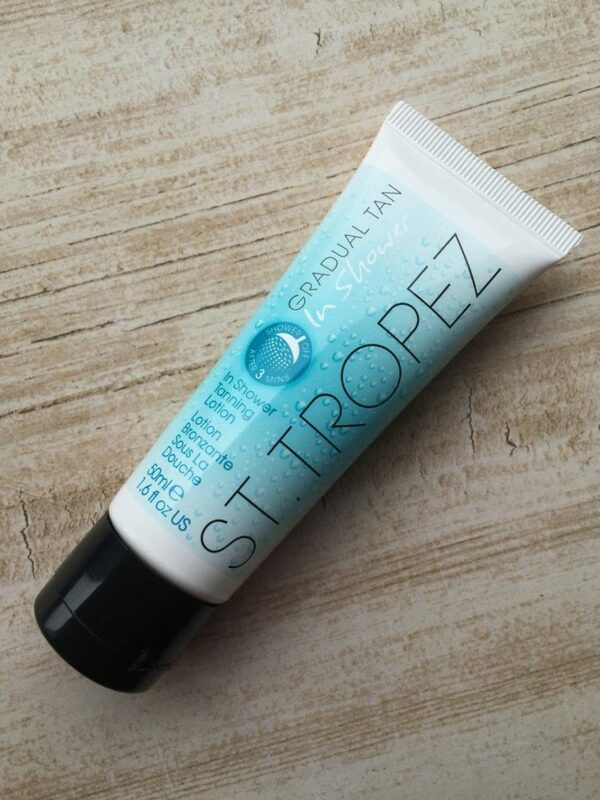 So in summary, what I would say is this – if St Tropez expand their new ‘In Shower Gradual Tan’ range to incorporate creams more suitable for medium and dark skin tones, I would most definitely try it out again as like I said, it really was such a brilliant product actually use. Sorry I’m sorry St Tropez – but I’d love you to look me up when you launch one for darker skin tones! Ooooh I didn’t know this was a freebie in a magazine!